Matt Young | Karkela Construction, Inc.
Matt Young joined the Karkela team in 2016, bringing with him 8 years of construction experience. 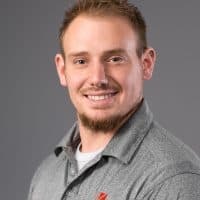 Matt started his own remodeling business at the age of 20 and with his outgoing and enthusiastic personality he built a business based on client satisfaction and trust. Over the years Matt completed hundreds remodels, many of which were featured on the Parade of Homes. In 2011, Matt decided to transition into commercial construction as a carpenter. The hands-on experience of building numerous types of commercial spaces including dental clinics, apartment complexes, medical and hospital equipment manufacturers, and numerous tenant improvement remodels has given Matt an eye for identifying issues early on allowing jobs to move forward efficiently. Matt enjoys fishing with his wife Kim, spending quality time with family and volunteering his skilled labor at various local charities.